House with garden. 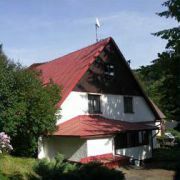 8-10 beds in a quiet area of Svoboda nad Upou - Dolni Marsov, direction Pec pod Sněžkou. The … More » house has central automatic heating, 3 bedrooms, kitchen, dining room, living room, TV/satellite, game room with table tennis, 2x bathroom and 2x toilet. Parking directly by the house. The database contains direct contacts to owners of accommodation in Dolní Maršov. Reservations are passed without any middleman and commission!